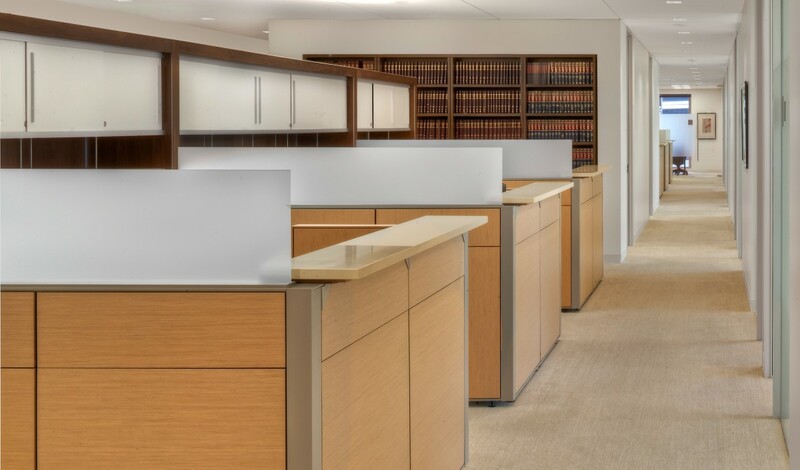 An office space supports a law firm’s increasingly collaborative work style—in a style that’s crisp, flexible, and pragmatic. Shook, Hardy & Bacon is a powerhouse product liability law firm. 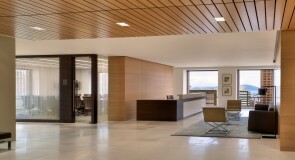 Headquartered in Kansas City, the firm maintains Midwestern values of tradition and practicality throughout its worldwide offices. When the firm leased 39,464 square feet at One Montgomery Tower to house its expanding San Francisco staff, it had the opportunity to create a signature space that reflected its values while supporting an increasingly collaborative work environment. 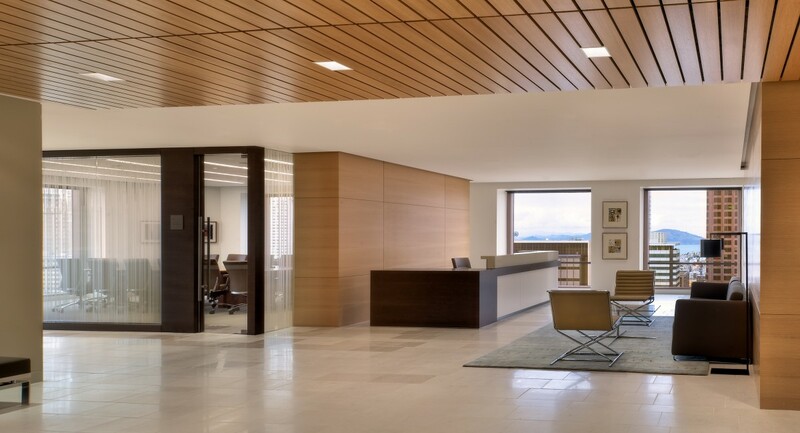 In tandem with firm leaders, RMW designed an interior build-out that is simple, modern, and within the TI allowance. The light-filled space emphasizes crisp details with a palette of sand-colored stone floors and carpets, dark wood accents, and chrome-trimmed midcentury furniture. 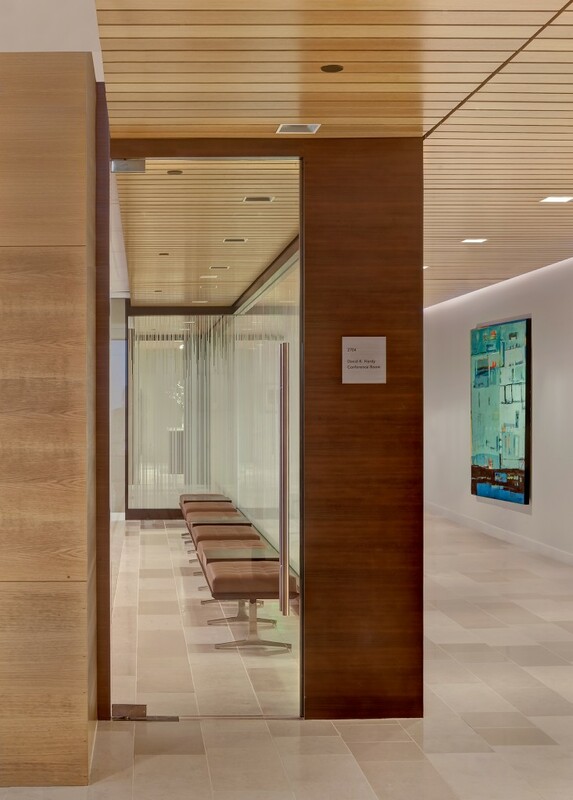 The spacious reception area serves as a mixing zone, opening onto a conference center that can be reconfigured as a flexible teaching area with corresponding refreshment serving counters. 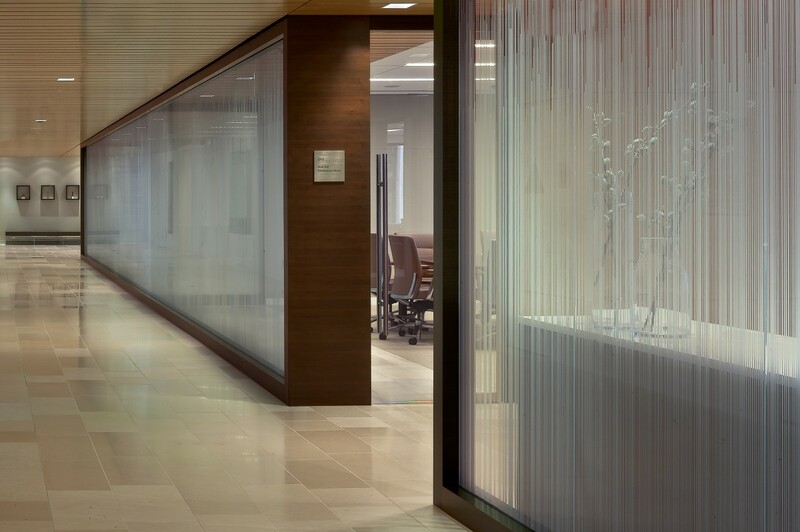 State-of-the-art technology is integrated discreetly into the finished surfaces to keep participants focused on issues at hand. Paralegal and administrative research teams are colocated in workstations designed with deep cubbies with overhead bookshelves, ideal for heads-down work. 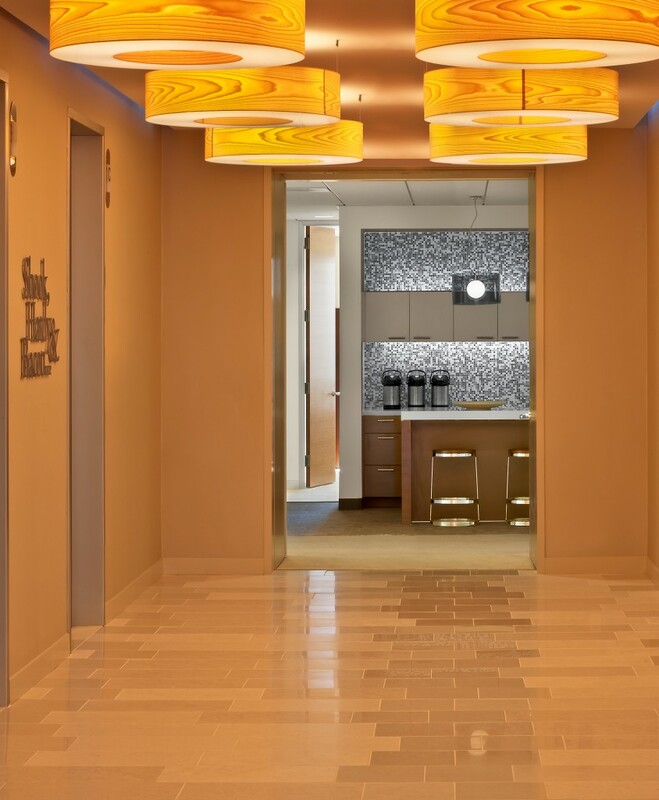 To encourage cross-team interaction, break spaces are located at the perimeter of workstations and off the reception area. In Shook, Hardy & Bacon’s old space, a mundane lunch room discouraged dining in and thwarted staff interaction. 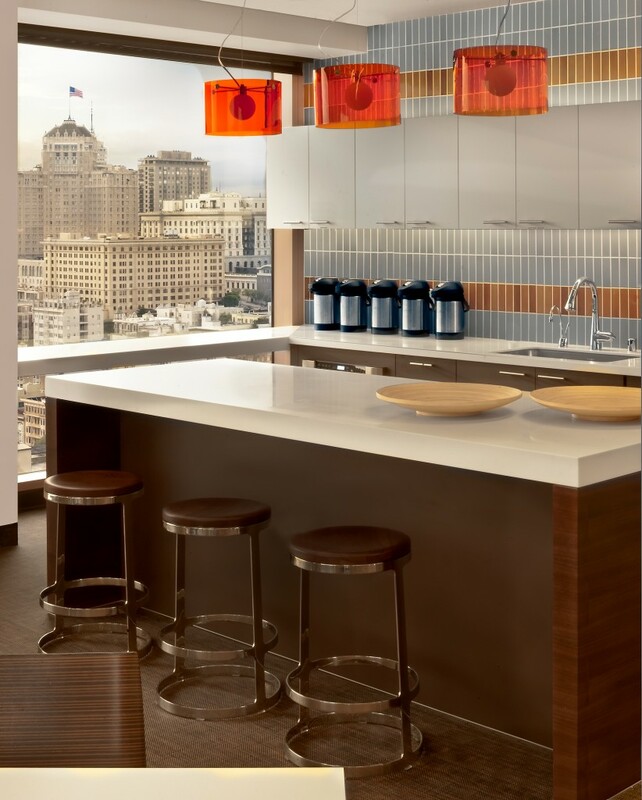 The new kitchen space, on the southwest corner of the 26th floor, commands views of downtown and Union Square and offers a variety of seating scenarios, including a community table, bar-height window ledges, and bistro banquette. 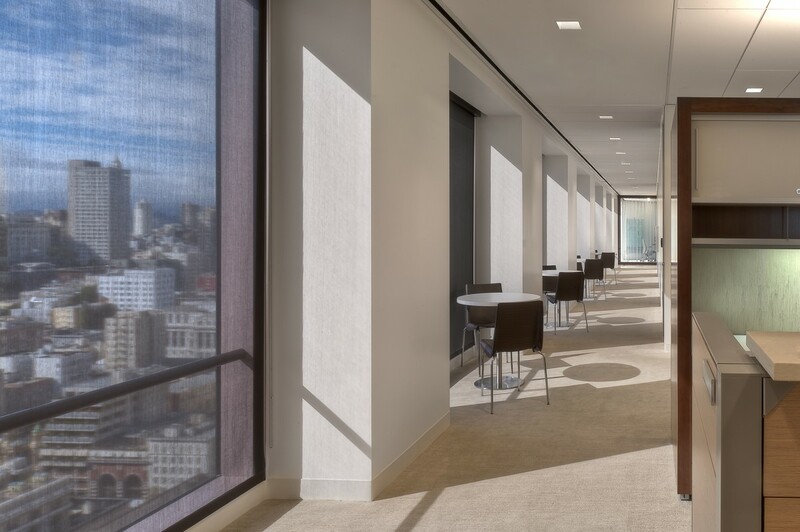 Through a forward-thinking use of space grounded in traditional interior finishes, the firm’s San Francisco offices convey its pragmatic personality. Shook, Hardy & Bacon now has an environment that works as hard as its employees do, and looks great while doing it. The project achieved LEED certification. 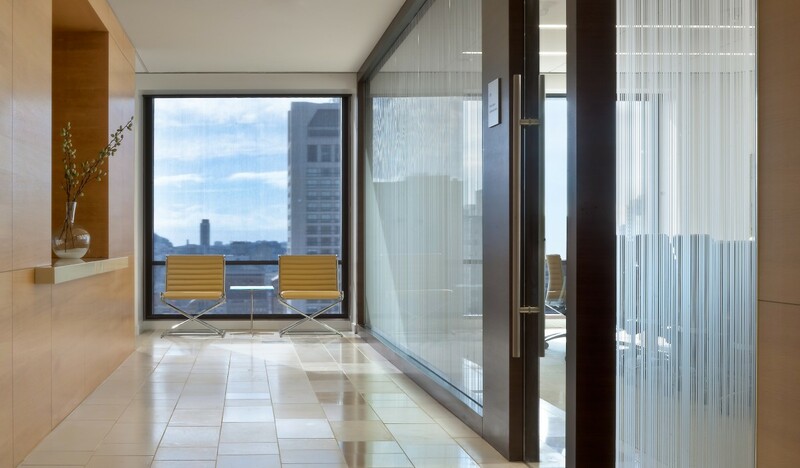 The eye-popping view inspired design choices such as semi-transparent translucent etched glass for interior conference walls. Award: 2012 Winner, International Interior Design Association (IIDA) Notable Achievement Award, Work Big Category.